So I was discussing this with my girlfriend, bemoaning the fact that the Tap was again overlooked. She agreed with me, but then said “I didn’t know they were a real band.” I started to say that they weren’t, but then thought, why aren’t they? They performed live, play their own instruments (quite well, actually), wrote their own songs, have released a few albums (the first one in 1984) and do, in fact, rock. 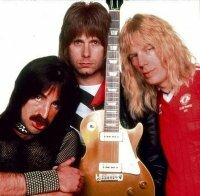 But there’s no Nigel Tufnel, he’s the Right Honorable Christopher Guest! But why should that matter? Robert Zimmerman from Minnesota can become freewheelin’ troubadour Bob Dylan in Greenwich Village. Jim Morrison created a mythology about himself that his parents died when he was young, when they actually outlived him. Gordon Sumner did the same when he began to become popular as Sting. None of the Ramones last names are Ramone, and David Bowie changed his name from Jones to avoid being confused with a Monkee (Not to mention his time spent as Ziggy Stardust, or the Great White Duke). I hate to break this to you, my small circle of readers, but Bono and The Edge are not their birth names, nor was Stevie born with the last name Wonder. Did any of these pseudonyms make these artists less worthy of hall-dom? Will the fact that Dr. John is not legally able to practice medicine keep him from joining this year’s inductees? (R.I.P. to Captain Beefheart, who I can find no mention in his obits of having served in the military or the merchant marine and is not related to the famous Beefheart family of Essex). Are the Beatles later albums excluded because Paul died in 1966 and was replaced by a look-alike who continues to impersonate him and formed Wings? I don’t think so! There’s a element of Rock and Roll that is about re-inventing yourself, about artifice. It’s part of the freedom and liberation it offers.